Ten mile races seem to be in decline. 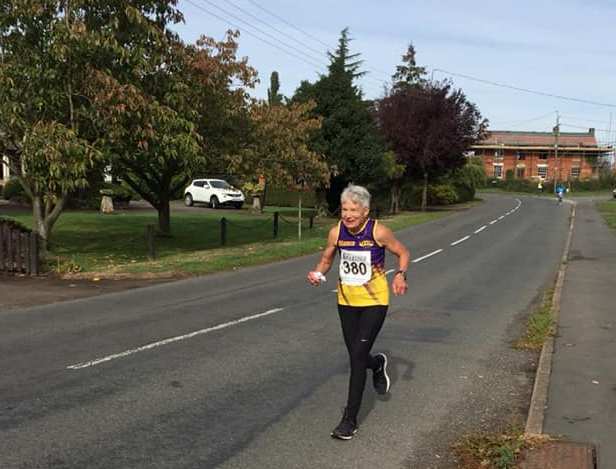 There’s a few kicking around, such as an excellent one that is put on in Leighton Buzzard each September, but whereas there are 10Ks and half marathons around every corner, finding a ten miler can be quite a challenge. However, in my view it’s a great distance to race. The easy maths of ten miles giving you obvious ten minute target blocks of 120 down to 50 if you’re super fast. It also nicely fills a large void between the two distances mentioned above. For whatever reason though, for us to find one for our club champs always involves a bit of travelling and this year we thought we’d try a new one (to us) in the shape of the Rugby 10. It is very traditional “old style” race. Do not come here if you want the frills of the modern running world. It’s £10 to enter and for that you get a ten mile race and a bottle of water! There’s no chip timing, funky medals or T-shirts created by designers here. The start and finish banners are sheets with “Start” and “Finish” hand painted on them attached to stakes in the ground and the venue is a small cricket club, with room for about 30 people inside. This is not a criticism. All runners are different with different motivations. For those who have drawers bursting with race T-shirts and a loft full of medals, the simplicity of this event is perfect, and the fact they were selling burgers afterwards was a bonus. Long may such races continue. The weather on this particular autumn day was perfect for running with minimal breeze and temperatures in single figures. Each one of the 12 pre-entered club members had made the hour journey up the road, but were slightly apprehensive about the “challenging” description of the course that looked horrendous on a narrowed profile of the route that showed hills as mountains that went on forever. However, the chill in the air made most of us jog the three-quarters of a mile down to the start/finish area to embrace the challenge. Having looked at the aforementioned profile, we all knew that there was unlikely to be any negative splits (second half faster than the first) going on, as most of the descent was in the first half so if you wanted a specific time, you would have to get those seconds in hand early on. The route was mostly on country roads around the villages of Barby and Kilsby on the south side of Rugby and had very little flat on the route. A kicker of a hill at mile three was the only interruption to lots of gradual drops in the first half, but then at around 5.3 miles you started a climb that only ended at 7 miles at the course’s high point near to the cricket club. Then a couple of quicker miles led into a final climb back into Barby and the finish. The race had increased in standard since 2017 when only six people got under the hour. We found out afterwards that there was battle going on between Leamington and Kenilworth for the Warwickshire Road League title that had encouraged a few fast boys out and meant that sixteen broke the hour this time around. In terms of performances from our guys, we had just three women out but Amy Inchley was pleased with her continued improvement to duck under 75 minutes again, while Liz Miller and Sue Johnson enjoyed their morning in the Northamptonshire countryside to come home in 1:46 and 1:54 respectively and back some good points in the club championship. On the boys front there were a few battles going on, which meant some earned excellent PB’s too. At the front end, Stuart Read smashed a new PB and took the club title in coming home in 59:16. Stuart had flown past me at half way, but I was pleased to find some fighting spirit that’s been lacking for a year to duck under the hour by a few seconds myself. In the next group back, after a fast start Chris George fought off challenges from Tom Inchley and a fierce one from James Bell to come home in third place. James was just behind in a new PB time of 61:21 and with him entering a new age-category in May, he may well be eyeing up a few club records….. Tom’s time came off the back of minimal training and an obstacle race in Nottingham the previous day to he was pretty pleased to be under 62 minutes, although wondering what he might have done with some actual preparation! There was a similar battle behind this group, with Warren Rose leading home Matthew Brooks, who out-sprinted Steve Sharples at the death. For Matthew and Steve it was a first 10 mile race since joining the club and they certainly appeared to enjoy the distance even with the odd blister, but a lack of experience over 10 miles can’t be attributed to Warren, whose time of 66:44 was also a new PB which he should be delighted with on that course. You can tell the London marathon magazines are out this week because Nick Clay is clearly starting the long build-up to next April’s race with a reintroduction to road running. His time of just over 70 minutes will simply be a base for him to build on over the course of the winter so I am sure there will be a steady improvement from here onwards. As a team, we tucked into third place behind Leamington and Kenilworth with James home as 3rd V45, probably the leading individual result on the day. All in all, it was a nice run out and on the basis that there are so few 10 milers around, it might be one we look at using again for club champs in the future. They were certainly pleased to have us there.